I’m never sure that ‘Banner Drops’ are ever really worth the effort. Used by protesters as a dramatic device, displaying a banner on some iconic building they may sometimes help to draw attention to a cause,and do seem to be reproduced far more often than they deserve. I suppose they are a simple idea and the editors who choose the images seem generally to be pretty simple. I suppose the first essential is to choose an iconic location, either for the actual display of the banner or as a background. Tower Bridge yes, Chiswick Bridge probably not. Unless perhaps it is somewhere related to the protest; Trenton might have saved himself a few months in the Scrubs by doing a banner drop there rather than jumping in and swimming on boat race day. And while it certainly wouldn’t have got him quite as much press, there would have been fewer negative comments and no vindictive establishment judge. Obviously the practicalities of actually displaying the banner are important, but also to be taken into account are the problems of photographing it. The event isn’t really the actual dropping of the banner, but the press pictures and TV footage of the banner in situ. 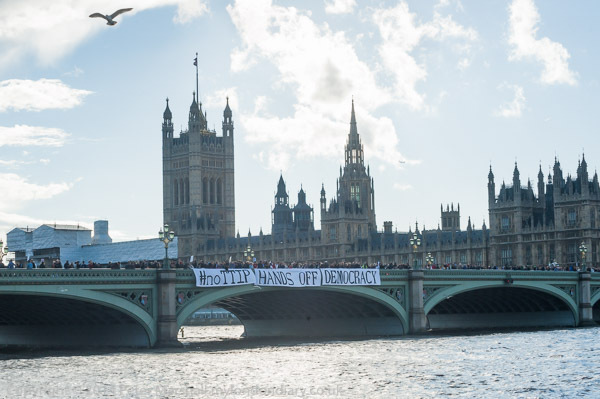 I’d photographed the three banners that made up the message ‘#noTTIP‘ ‘Hands Off‘ ‘Democracy‘ earlier on Parliament Square. They spread more or less across its full width and it was hard to get the whole message in, and even harder to get the whole area between camera and banners clear of people. 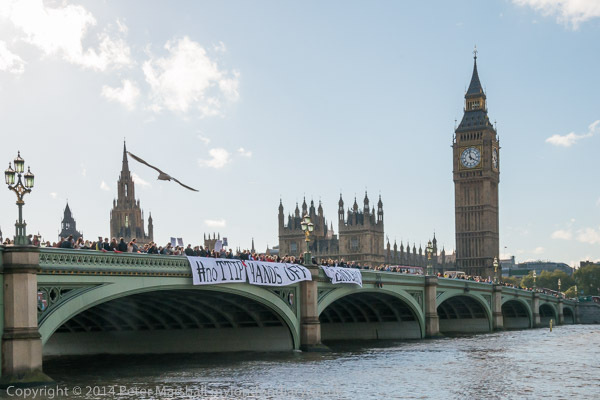 When they took the three banners onto Westminster Bridge, I realised I needed to run to get the picture I wanted. None of the photographers knew exactly where the message was going to end up (and certainly not the people taking it onto the bridge.) We ran across the bridge, and then through the crowds of tourists on the riverside walk in front of the former GLC building. I kept on until I was in a position I thought would work best, perhaps a couple of hundred yards downstream of the bridge. or take a wider view showing that very recognisable clock tower behind it. There were however two problems. Firstly the light, with the sun shining brightly just out of frame; flare and ghosting were hard to avoid, and because of the position of the sun it wasn’t really possible to get the wider view including the top of Big Ben’s tower. It didn’t help that I’d stupidly left the lens-hood of my 70-300 on the desk at home (the only time I’ve forgotten it), but I would still have needed to use my left hand to flag the sun and avoid excessive flare, while waiting for the moments when the wind eased off and the banners stopped fluttering up and came to rest going down from the parapet. 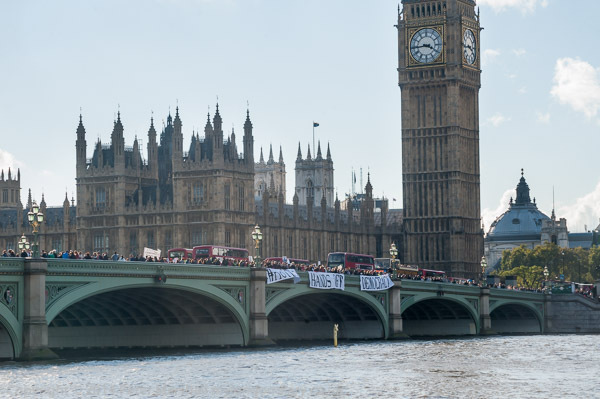 But the real problem was that some photographers hadn’t run far enough, and couldn’t really read the message, and were phoning for the banners to be moved further across the bridge. So before I really got the image I wanted, those banners were on the move. The glare from the river was really making things difficult, but I took another picture and liked the seagull at the top. But then they were on the move again. 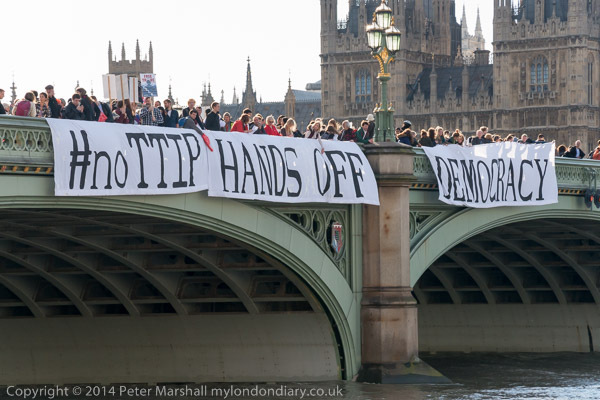 and the #noTTIP had disappeared…. And it is a vital message. 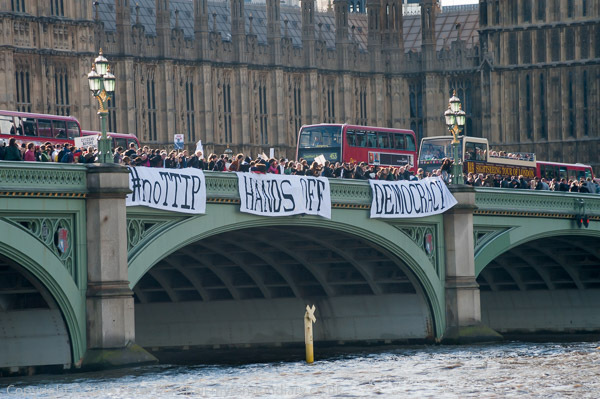 TTIP is a commitment to a corporate future, one that gives free rein to the giant corporations to run the world their way and for the interests of the wealthy. 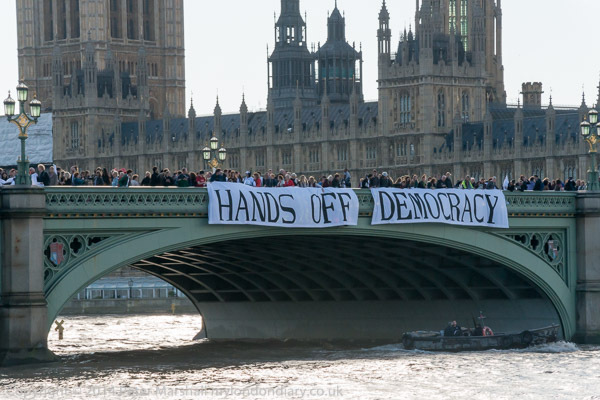 Democracy may not be too healthy in this country, with the two major parties (an UKIP) largely supporting corporate interests, but at least there is some hope, with just a few of our politicians still championing the needs of the people as a whole. 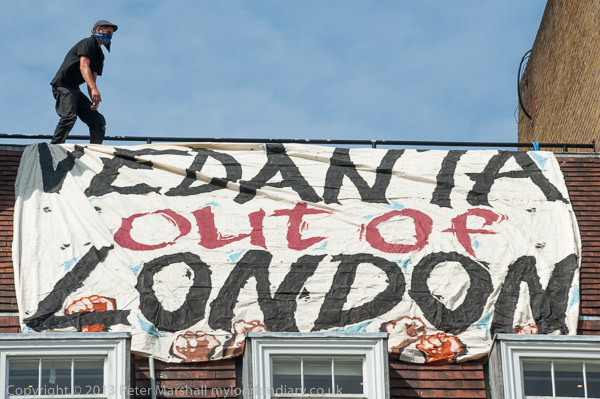 You can see just a few more pictures of the banner drop at #NoTTIP – Banner Drop, and a few of the protest that led up to it in #NoTTIP – Hands off our democracy, though I was also busy with other events. 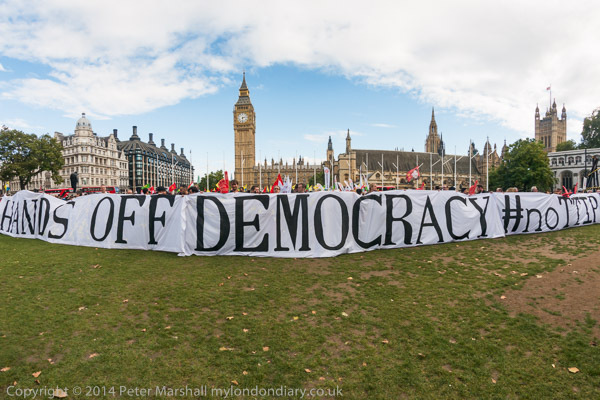 There is more about TTIP (and its Canadian version CETA) on My London Diary at CETA (TTIP) Trade Deal and CETA Trade Deal Threat to Democracy. This entry was posted on Friday, December 26th, 2014 at 10:38 am and is filed under My Own Work, Photo Issues, Political Issues. You can follow any responses to this entry through the RSS 2.0 feed. You can leave a response, or trackback from your own site.